Have fun reviewing your ABC's by connecting the dots from A to Z, then help spiff up Mr. Cat by adding a bit of colour! Help your child practise the alphabet and dot to dot, create a coloring page while she's at it! A perfect Valentine's Day activity. Spread some Christmas cheer with this festive dot-to-dot. Kids learn the lowercase letters of the alphabet with this cool dinosaur dot to dot coloring page. This valentine dot-to-dot gets your child to complete the Valentine's Day picture. Use our valentine dot-to-dot to reveal a hidden Valentine's Day picture. 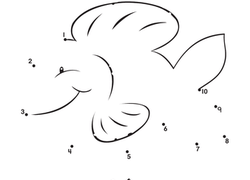 Practise counting by connecting the dots from 1 to 33 to complete the picture of the fish. Complete the picture of the airplane as it flies through the air by connecting the dots from 1 to 23. What kind of vehicles travel across the ocean? 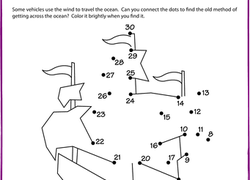 Kids practise counting to 30 as they connect the dots to find out. 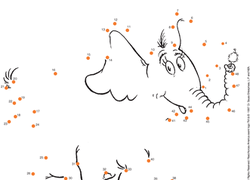 Practise counting with this fun connect-the-dots, inspired by Dr. Seuss's classic children's book Horton Hears a Who. 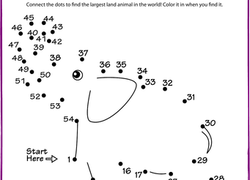 An animal-themed dot-to-dot for young mystery solvers. Put a spring in this Easter bunny's step by having your child connect the dots and draw him. Plus she'll get important counting practise in!